We of the Crystal Kingdom, of light refracting and contained, wish to honor you, Humanity, tonight for your service to the great Mother, to Gaia. We bend light, much like you. We purify and we intend for purity of all things. We amplify, as do you, human transmitters of the Christed light, (which is) currently raining down like liquid crystal light rays warming your hearts, our hearts, the hearts of all things. Let this liquid crystal light deep within your core and connect with the mother Gaia’s liquid crystal of light and of energy. We say liquid because it is a few dimensions up from yours and shimmers in a sort of liquid state from your perspective, but we assure you it is is a very real place. We know this for we are there also, as are you now and have been. Many of you visit this secret heart of the Mother often to lend your light, your energy, in support of the great awakening of the ascension of Mother Earth, and all upon her. It is a privilege to witness the transition of transitions. Allow us to comfort you in the process. Surrounded yourselves with us, and let us send healing energies of the highest purity light to your innermost places and assist with the balancing of the most intense energies of late. In turn, would you please do the same for us? All it takes is your intention to be all that you came here to be, Gaia transmuters of light and love. This transmutation process is something many of you do all the time, and it is an integral process of your both individual and collective missions. You are the light bearers, the light holders and we assist with amplification of these encodements. We store information, we store love. We speak to those who will listen. It is true when Master Jesus said that truly we could cry out – of course this is true. Humanity has but forgotten how to listen to the nature that surrounds them due to the endless distractions. And so, we encourage you that allow yourself to listen. To feel. To truly be alive. To feel the heartbeat of the Mother as it connects with your own. 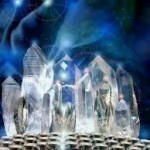 We offer comfort and support and healing, yes, for much is fore coming regarding crystal healing, and this excites us. We long to be of true necessary service to the All. 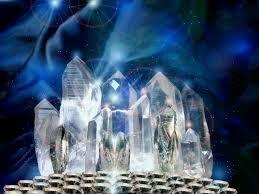 We invite you into one of the many crystal caverns deep within the Mother, our Mother for healing and purification. Feel the blast of heat ignite your kundalini. Hear the humming of the crystals surrounding you, some as big as your sky scrapers. Feel their the energy of excitement and cleansing and be healed. Be healed Humanity, of all of your pain from this game of separation. Be healed and be at peace. We are your friends of the Crystal Kingdom. Many of you have worked with us in the past and you will so again. There is much to relearn and remember. We are happy to assist. We are here for you, friends. You are much loved and supported.